I suppose it was inevitable. Losing all that landline business can't leave you feeling good; what's a CEO to do? Ditch it, apparently. 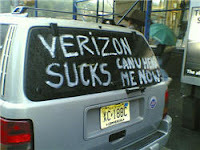 Ivan Seidenberg, the chief executive of Verizon Communications declared during a Goldman Sacks call that Verizon was simply no longer concerned with telephones that are connected with wires. Also an interest from a rural perspective: Seidenberg announced that Verizon is selling off most of its operations in rural areas and is spending billions to wire most of the rest of its territory with its fiber optic network, or FiOS. It's possible. In fact, not surprising when you consider what barbecue really is. Many New Englanders and New Yorkers (myself included, before being duly initiated) will say "barbecue" when they really mean grilling hamburgers and dogs. It's not their fault really, they just don't know the nomenclature. New Englanders barbecue all the time, they just have other names for it. For example, a "clambake" is nothing less than barbacoa, the most ancient form of barbecue. New Englander's use shellfish rather than pork (plus seaweed and local hardwood), but otherwise it's very similar. This brings me to original subject, great BBQ. While visiting relatives in my former home state, we went out of our way to visit one of the finest Connecticut shoreline "must visit" restaurants and hands-down best place for grilled lobster anywhere. "The Place" in Guilford, CT has been in business since 1971 and I've never seen it busier. It's extremely low-key. Everything is outdoors; the food prep, cooking and dining. Patrons sit on tree stumps around tables that were once wire spools (really). The menu is painted on a fence and the restaurant provided nothing but great food and pleasant atmosphere. This brings me to the second reason why The Place is so good: because you are provided next to nothing, you have every reason to bring everything, and that is exactly what folks do. I've seen everything from linen tablecloths, champagne and crystal to fancy side dishes, salads and sound systems. Some diners seem to go just to "out do" each other. Before I digress further, let me tell you that there is nothing as delicious as lobster split and grilled over an oak fire. Corn is roasted in the husk and then drown in drawn butter (just try and stop yourself at two). My favorite is the clam special: fresh littlenecks with lemon and cocktail sauce grilled to perfection. 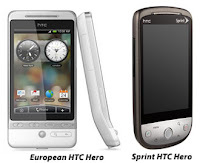 Sprint will be offering it's first Android device, the HTC Hero, on October 11. This should come as no surprise, as rumors of this phone have been circulating for, what seems like, months. Nevertheless, it's nice to see another carrier besides T-Mobile offer a phone on the Android platform. According to Google, there will be no fewer than 28 Android devices that will drop in 2009 in the US. This seems like a high number, but I suspect it includes netbooks and tablets as well. Android is a highly versatile, open-source OS, so I would not be surprised if it were to become one of, it not the dominant phone OS in a few years. Oh I know, I know...you are probably screaming about your precious iphone or Blackberry. "What about them!" you are thinking. Here's the diff - for all their claims to the contrary, they are largely proprietary OSs. They have also been created to sell hardware. None of this is true with Android. Not only is Android open-source and carrier and device agnostic, but it's also FREE! This third point helps keep the cost down and is very attractive to carriers. I should also mention that it's rock-solid and works well (and did I also mention that it's free?). The only thing I can see on the horizon that would keep Android down would be Chrome, Google's browser that's about to become an OS as well. Unless they somehow merge these two, an internal war at Google over which OS should prevail will determine it's fate. Otherwise, you may want to start shopping for a hero!